Black PVC cable, 1200mm black plug to black switch, 600mm black switch to lampholder. Product code:57694X2. Rated 5/5 for service! 40W E27 ES GLS (required). A fantastic handcrafted Copper Pipe Lamp with Edison Bulb included, made using new 15mm copper pipework and copper fittings. Copper Pipe Lamp with Edison Bulb. However, if you wish to maintain the bright copper style, a regular polishing (with a cleaning product like Brasso) will keep it shiny depending on the look you wish to achieve. Perfect for both classic and modern spaces, it is finished with copper details and a cylindrical purple shade. It requires 1 x maximum 42W bayonet cap GLS or classic 8.5W LED bulb. Colour:Black and Copper. 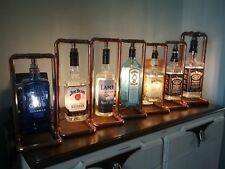 A fantastic handcrafted Copper Pipe Lamp with Edison Bulb, made using new 15mm copper pipework and copper fittings. However, if you wish to maintain the bright copper style, a regular polishing (with a cleaning product like Brasso) will keep it shiny depending on the look you wish to achieve. A fantastic handcrafted Copper Pipe Lamp with Edison Bulb included, made using new 15mm copper pipework and copper fittings. However, if you wish to maintain the bright copper style, a regular polishing (with a cleaning product like Brasso) will keep it shiny depending on the look you wish to achieve. This black tripod table lamp features satin copper details on the legs and lampholder for a touch of contemporary luxury. Requires a 40W Max E27 light bulb and is suitable for use with LED bulbs. 40w Max E27 (required). Copper & White Fabric. This table lamp requires a max 40W BC light bulb and is suitable for use with LED bulbs. The table lamp switches easily on and off at the lampholder. A contemporary addition to your bedroom, lounge or hallway. Copper Pipe Table Lamp. However, if you wish to maintain the bright copper style, a regular polishing (with a cleaning product like Brasso) will keep it shiny depending on the look you wish to achieve. Lumberton Lantern Lamp. Lamp features rustic copper finish, 3 way switch with night light option and wood ball finial. Designed and manufactured by Park Designs. Lamp requires 100 Watt bulb, nightlight requires 40 Watt bulb. Chloe Lighting - 2-Light Round Table Lamp [ID 3601896]. Hand crafted from individually hand cut pieces of copper-foiled stained glass that will add color and beauty to any space. Pull chain switch. Dark antique bronze finish. Mosaic base. 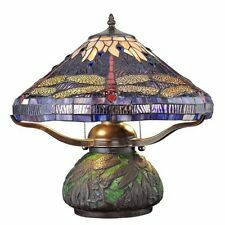 The lamp was artfully created using hand-cut pieces of stained glass individually wrapped in fine copper foil made popular by Louis Comfort Tiffany in the early 1900s. 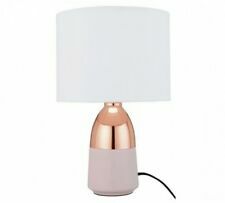 Chloe Lighting - 2-Light Table Lamp [ID 3601854]. Hand crafted from individually hand cut pieces of art glass that will add color and beauty to any space. Pull chain switch. Assembly required. Requires two 60 watt E26 type A bulbs. The copper will naturally age, developing it's retro character as it does so. Here at DoktorGudärhär Illuminaire we hand build unique lamp artwork both from our catalogue and to uniquely commissioned pieces. Copper Pipe Lamp hand made using new 15mm copper pipework with brass fittings and Old English Brass coloured lamp holder. E27 240V 40w Edison Bulb. This copper table lamp is handcrafted individually. A fantastic handcrafted Copper Pipe Lamp with Edison Bulb and cage included, made using new 15mm copper pipework and copper fittings. Copper Pipe Lamp with Edison Bulb. However, if you wish to maintain the bright copper style, a regular polishing (with a cleaning product like Brasso) will keep it shiny depending on the look you wish to achieve. 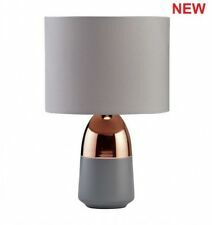 Chloe Lighting - 2-Light Percy Table Lamp [ID 3602027]. 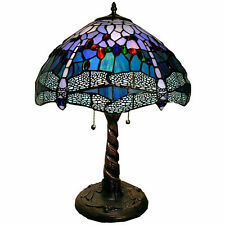 Percy, a tiffany-style table lamp brings nostalgic warmth to your room. it features wavy patterns in blue, amber and dark brown colors. The dark bronze base brings elegance to any surface it rests on. 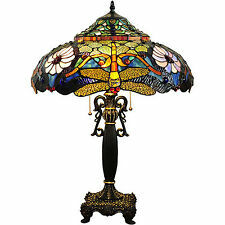 It is perfect for interior spaces with an ornate, fanciful and decorative style. Dark antique bronze finish. Assembly required. Requires two 60 watt E26 type A bulbs. Number of Lights 2. Item #: 837912. This retro 1950's inspired Bauhaus Table Lamp in ochre yellow and copper features an adjustable head and copper arm and ring detail on the shade. A modern touch for any home, the lamp by the Lighting and Interiors Group features a white inner for maximum light reflection and is ideal for use as a bedside lamp or desk lamp. Height 47cm x Width 30cm. 60W halogen bulb required. Boxed. It has an inline switch so the base maintains its warm shine and the rounded shade gives it a classic finishing touch. 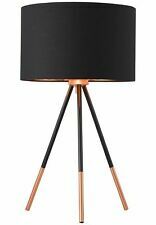 This Elegant Style 48cm Tall Desk Lamp is Brushed Copper Finished. Retro Desk Lamp. Brushed copper. Retro Look. Lamp is on a UK plug (3Amp). Truly stunning and unique table lamp professionally crafted to the highest standard. 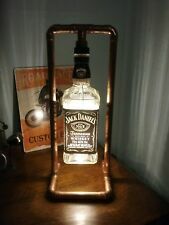 An antique Mysto copper fire extinguisher has been given a new lease of life and converted into this amazing lamp.